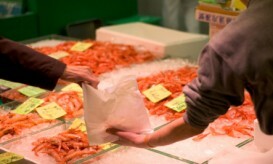 Shopping at the fish market in Tokyo. Trader handles bag containing prawns to the buyer. A varierity of different kinds of prawns in the background.